Basic Ingredients: Vodka or Everclear (for bulk), Apple Juice, Cinnamon Sticks. Mix Apple Juice and Booze, either a good quality Vodka like Absolute or Skyy in equal parts (1 to 1) in a large container. Add 2 cinnamon sticks and allow to soak for a few hours or days. For a stronger shot, replace Vodka with Everclear neutral grain spirits (151 or 190 proof) and it will knock your socks off! For a bar setup, we like to keep this shot on hand for several weeks in the fall, so we prepare it in bulk. We use a clear empty glass vodka bottle with a pour spout as the dispensing container. To brew the concoction, we use a large apple juice bottle and empty out half of the juice, replacing that with our booze. Throw in a couple of cinnamon sticks and let it hatch for as long as you like. The booze will prevent any spoilage, but don’t let it sit too long. 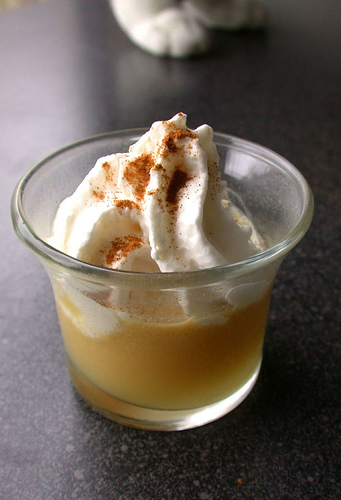 You can keep the serving bottle in your keg box to cool it down, then to serve, just pour into a 1 oz shot glass and top with whip cream and a sprinkle of ground cinnamon. Enjoy! Sounds really good with booze. Great article. 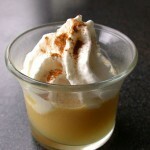 For the apple pie shot recipe, after I mix the ingredients for a couple days, can it sit on the kitchen counter or does it need to be refridgerated?